Capital Fund Law Group advises companies and entrepreneurs on raising equity and debt capital through Regulation D private placement offerings. We assist clients throughout the United States to navigate the rapidly evolving securities laws and SEC regulations. We have experience preparing private placement offerings through a variety of Regulation D offering structures and in every major industry sector including: investment funds, real estate, oil and gas, lending and finance, medical devices, food and beverage, manufacturing, film finance, automotive and others. Our flat-fee private placement services include start-to-finish counsel with all aspects of preparing a private placement offering, including choosing the proper exemptions, structuring the offering terms, preparing the necessary documentation to create additional classes of security interest, preparing the private placement memorandum (PPM), filing the federal Form D filings and advising the company on legally marketing the offering. 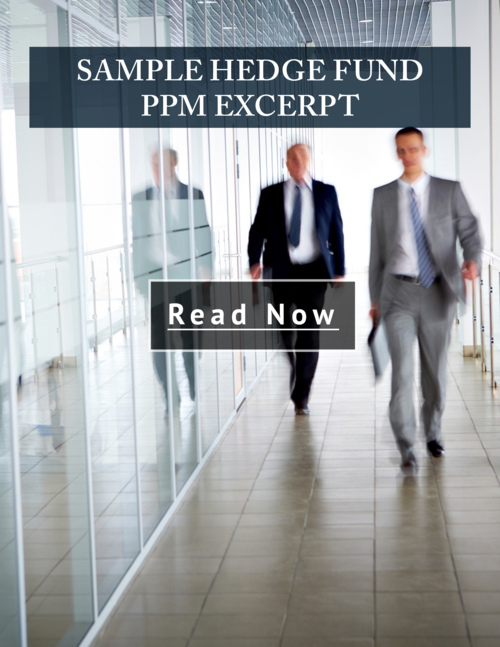 We have authored numerous industry publications, including eBooks, white papers, PPM excerpts and blog posts dedicated to helping businesses understand various aspects of private placement offerings (scroll below to read and download). Our firm has been quoted on securities law topics in some of the nation’s leading financial publications, including Forbes, Entrepreneur, and Business. Call (212) 203 - 4300 or email us to schedule a complimentary consultation with one of our attorneys to discuss the legal structure, regulatory requirements, timeline and costs involved in preparing a private placement offering. Raising Capital Through a Regulation D Private Placement | By John S. Lore, Esq. 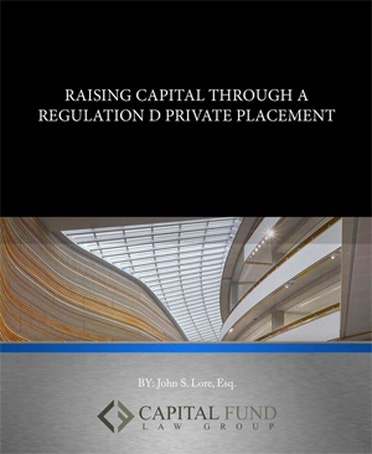 This eBook provides a guide through the process of raising capital by a private securities offering through the use of a private placement memorandum (“PPM”). The eBook explores the various components that are involved in structuring and preparing a private securities offering, including: how to determine the offering structure, choosing the proper registration exemptions and marketing the offering to qualified investors. To effectively raise capital through a Regulation D private placement, a company must safely navigate the complex regulatory structures that govern the offering. Unintentionally deviating from regulatory disclosure requirements can result in serious consequences for the issuer and its directors, officers, and managers. Experienced legal counsel plays a vital role in guiding companies through their various responsibilities and can help managers avoid devastating mistakes as they raise capital. This white paper describes a private placement for an operating company in a debt or equity capital raise by a single company. For information on structuring an offering for a multi-asset pooled investment fund, such as a private equity fund, real estate fund, or hedge fund, please see our white paper entitled: Investment Fund Legal Documents. The Following is a concise model excerpt of a private placement memorandum (PPM) for an operating company (a single-entity issuer, rather than an investment fund). The PPM is based on a fictitious early stage New York medical device company raising series A financing for FDA approval and initial manufacturing. Although the document is focused on a narrow industry, the excerpt illustrates the level of specificity that an operating company PPM should have, particularly in its risk factors. Many issuers make the mistake of relying on template-driven, boilerplate language that fails to identify risks and contingencies specific to the company’s business and regulatory climate. The Following is a concise model excerpt of a private equity fund private placement memorandum (PPM). 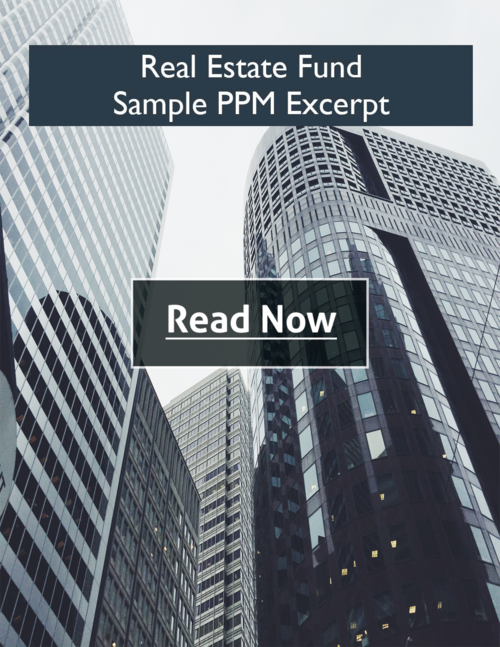 The PPM is based on a fictitious closed-end real estate fund investing in multi-family residential real estate in California. The excerpt highlights many of the fund investment terms that should be considered when forming in a private equity real estate fund. The excerpt is intended to provide an idea of the type of information and level of detail that should be expected in a fund and provide a starting point for discussions with an investment fund attorney. OUR LEGAL COUNSEL HAS BEEN QUOTED IN LEADING FINANCIAL PUBLICATIONS, INCLUDING FORBES, ENTREPRENEUR, BUSINESS, AND OTHERS. CAPITAL FUND LAW GROUP HAS BEEN RECOGNIZED FOR ITS INVESTMENT FUND EXPERTISE BY WEALTH & FINANCE INTERNATIONAL IN ITSALTERNATIVE INVESTMENT AWARDS. "There's a lot of short-term trepidation based on regulatory uncertainty based on the SEC, with what the European Union is doing, and what various Asian regulators are doing," said John Lore, managing partner at Capital Fund Law Group. Lore's firm advises hedge funds and private equity groups in the crypto-space. He said he's seeing an "unprecedented" number of new fund starts continuing from February. "I think the sell-off this year has more to do with short term concern than any long-term general distaste for the asset," Lore said. The SEC’s desire to interview cryptocurrency hedge funds, the only asset managers currently operating in the space, seems a logical next step in the development of the digital asset regulatory framework. The probe also underscores the fact that the SEC takes the crypto hedge fund space very seriously and will continue to keep a close eye on it moving forward. OUR CLIENTS ROUTINELY COMMENT ON THE DEPTH OF OUR KNOWLEDGE, THE LEVEL OF SOPHISTICATION, AND THE TIME WE TAKE TO PROPERLY UNDERSTAND AND IMPLEMENT THE CLIENT’S UNIQUE OBJECTIVES. BELOW IS A SAMPLING OF OUR CLIENTS’ PERSPECTIVE ON OUR SERVICE.